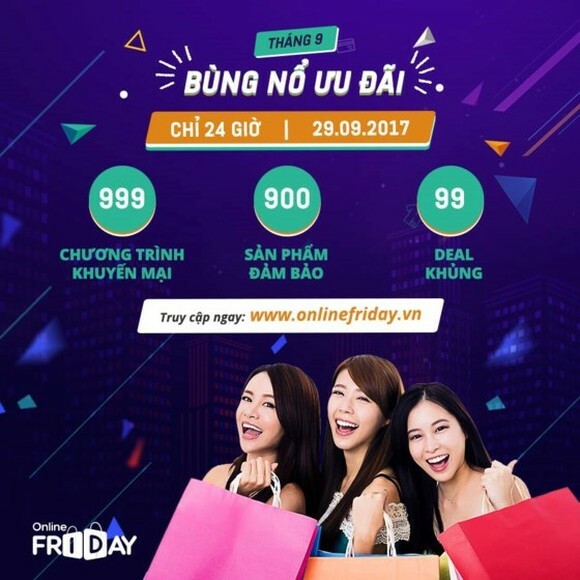 999 promotional programs will be launched at www.onlinefriday.vn on the Online Friday 2017, an online shopping day within 24 hours which will be scheduled on September 29. The annual event will offer to shoppers thousands of products and services in beauty care, healthcare, fashion, tourism and technology sectors with the participation of many big retailers and distributors such as Nguyen Kim, MediaMart, FPT Shop, Sunhouse, Adayroi, Dong Luc, Fahasa, Giovani, Sendo and more. The BigOFF event creating a shopping experience where online and offline intersect (online-to-offline -O2O) will also be held at commercial centers and retail stores in Hanoi on the day. The annual Online Friday is organized by the Vietnam E-commerce and Information Technology Agency under the Ministry of Industry and Trade and the Vietnam E-commerce Association.